Canggu is the up-and-coming area in Bali where the young and hip prefer to stay while on vacation. Filled with cute, Instragrammable coffee shops and tons of boutiques, everything you need is right there! The beaches of Canggu have ideal surf breaks and lively bars with comfy lounge chairs. Canggu is an ideal choice if you’re are looking for a neighborhood that is less crazy than Kuta, and more hip than Seminyak. If you’re wondering what there is to do in Canggu then read on for our favorite things to do in this trendy area of Bali! The currency in Indonesia is the Indonesian Rupiah (IDR) and at the time of writing (March of 2019) the exchange rate was 14,294 IDR to $1 USD. Many restaurants and bars add a “service charge” to your total bill. Check it before leaving an additional tip. There are very few sidewalks around Canggu so it’s not exactly pedestrian-friendly. Most people choose to rent a motorbike and drive everywhere they need to go. Canggu is located on the Western coast of Bali, just north of Seminyak. From the Ngurah Rai International Airport (DPS), it takes about 45 minutes by car to reach Canggu. Don’t bother trying to negotiate with the aggressive taxi drivers who will undoubtedly try to rip you off, use the Grab app instead. It’s the SE Asia version of Uber. Unfortunately, Canggu isn’t very pedestrian-friendly. Sidewalks are virtually non-existent and you’ll need to be mindful of motorbikes zooming by on the narrow roads. Most people choose to rent a motorbike to get around town. Your hotel or guesthouse will almost certainly offer motorbikes for rent and if they don’t you can find rental shops on almost every corner. Expect to pay around 50,000 IDR per day for a motorbike rental in Canggu. If that makes you uncomfortable, download Grab or GOJEK, they are the Ubers of SE Asia. Keep in mind that there is a taxi mafia in Bali. The taxis don’t want Grab or GOJEK encroaching on their business. Apparently, they’ve gone so far as to smash the windows of Grab drivers as a scare tactic. So don’t be surprised if you call a Grab and the driver either must cancel or asks that you move to another spot as they may not be allowed in that area. 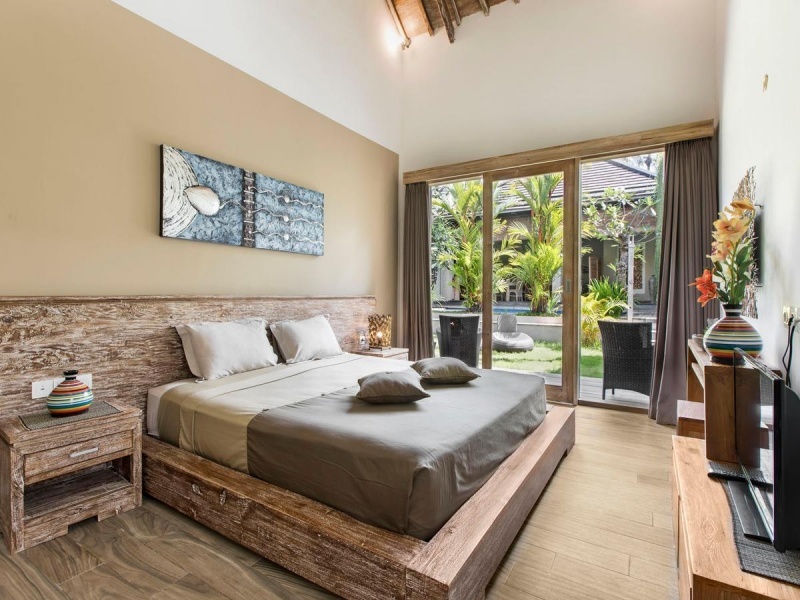 Exotica Bali Villa Bed and Breakfast is a gorgeous villa with teak furniture and modern decor. You’ll love the pristine outdoor pool and it’s close proximity to Batu Bolong Beach. Rooms are spacious, beds are super comfortable, and bathrooms have perfectly picturesque stone tubs for relaxing! 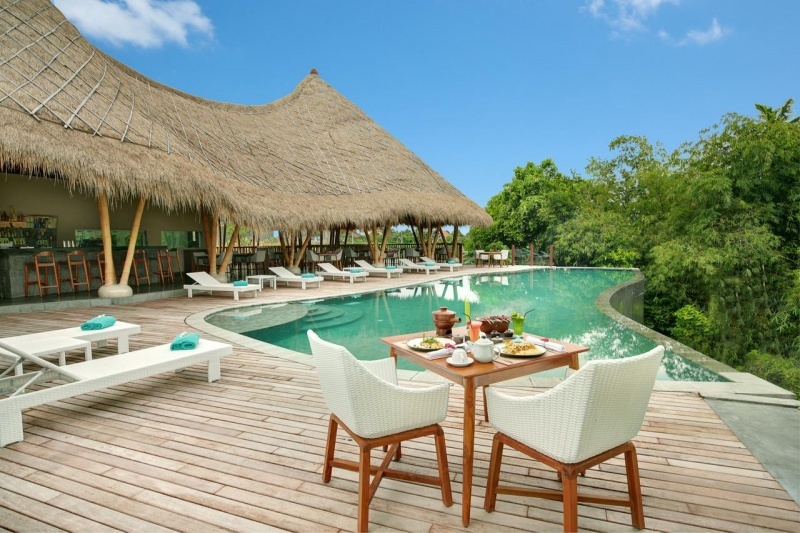 Theanna Eco Villa and Spa offers beautiful, traditionally decorated villas with private pools. You can take advantage of the free bicycles or the free shuttle service to the surrounding area. The staff here are wonderful and will take care of anything and everything you need. Indulge yourself in a day at the relaxing spa during your stay! 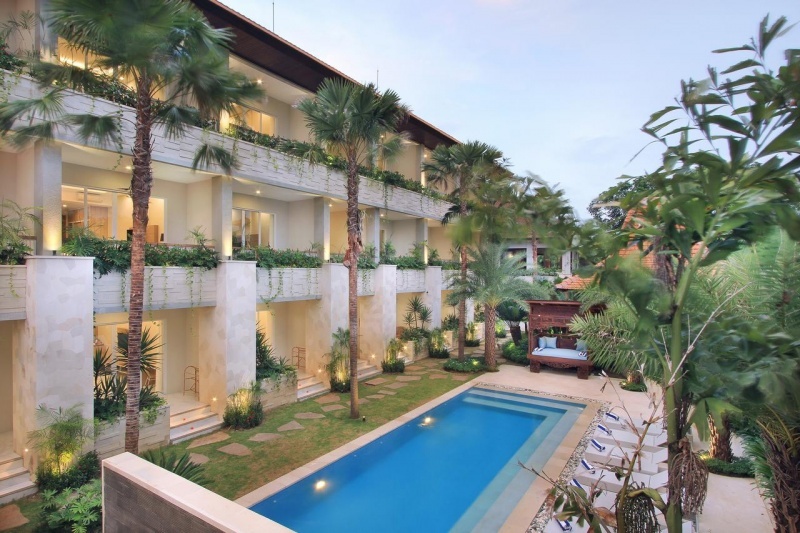 Tapa Tepi Kali is a beautiful hotel located just a short walk from the beach. You’ll love the incredibly kind and caring staff at Tapa Tepi Kali as they help you arrange transportation and tours. Take advantage of the onsite spa as well as the yoga and cooking classes during your stay! 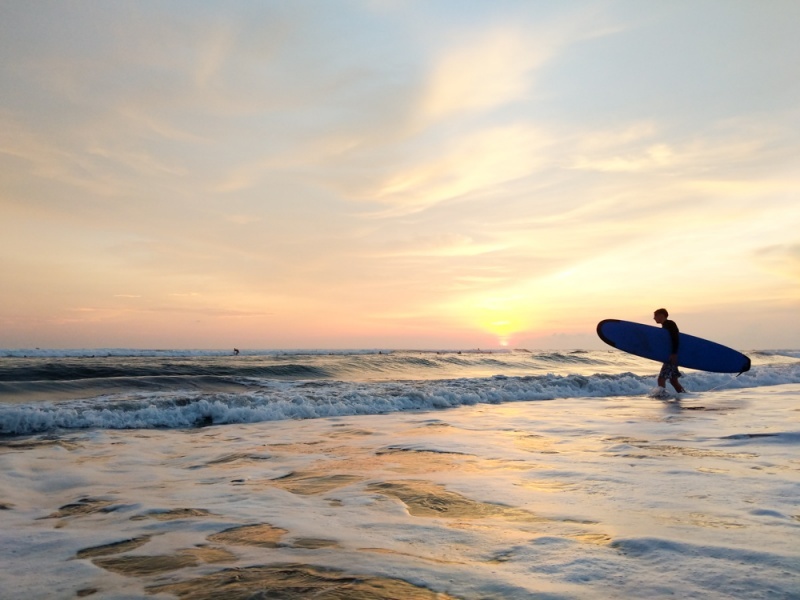 Bali is known for surfing so of course, it’s the top thing to do in Canggu. There are several popular surf breaks in Canggu and plenty of vendors nearby to rent you a board for a small fee. Expect to pay about 50,000 IDR for a 2-hour board rental. You’ll want to check the surf report before heading out. The surf break in Canggu that is the furthest south is Pantai Berawa. It’s located near Finns Beach Club on the main road. This is a long beach break and it’s generally not nearly as crowded as Old Man’s. There are several small vendors here that rent boards and lounge chairs for a small fee. Batu Bolong Beach is another popular break that is also commonly known as “Old Man’s” since it’s directly in front of the bar it is named after. This is the easiest break in the area and there are often beginners taking lessons so be careful. After your surf sesh, head over to The Lawn Canggu for a refreshing cocktail and some live music. If you head even further north you’ll find a surf break at Echo Beach. The waves are much more powerful here and not recommended for beginners. 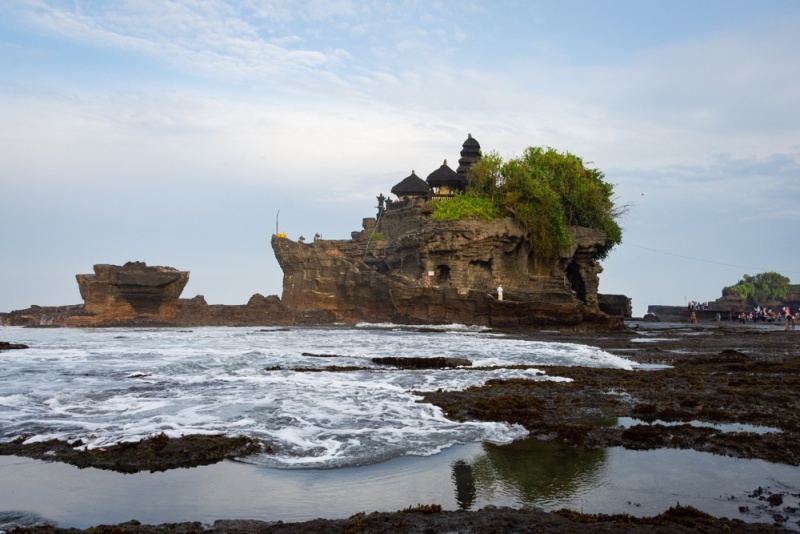 Tanah Lot Temple is a temple that is located on a small island right off the coast. It takes about 30 minutes to get there in a car from Canggu. During low tide you can walk out onto the beach to the left of the temple for some really beautiful views of the coastline. Sunset is a popular time of day to visit Tanah Lot Temple. There are several small restaurants along the cliff that overlooks the beach. You can relax here with a cold beer and snack while enjoying views of the temple while the sun sets over the horizon. It’s bound to be one of the highlights of your trip to Canggu! It’s not really a vacation in Bali until you’ve taken a photo of your smoothie bowl and posted it on Instagram. In fact, you can even get your brunch served on a floating tray while hanging out at the pool at Cabina Bali. It’s the perfect place for the perfect Instagram shot! 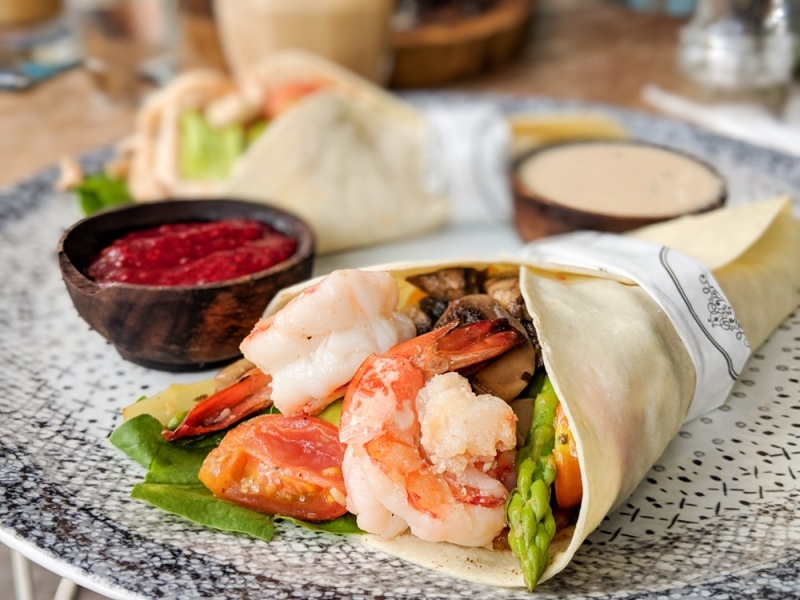 In all seriousness, the cafe scene in Bali is pretty remarkable and eating a delicious and photogenic brunch is one of the must-do things in Canggu. 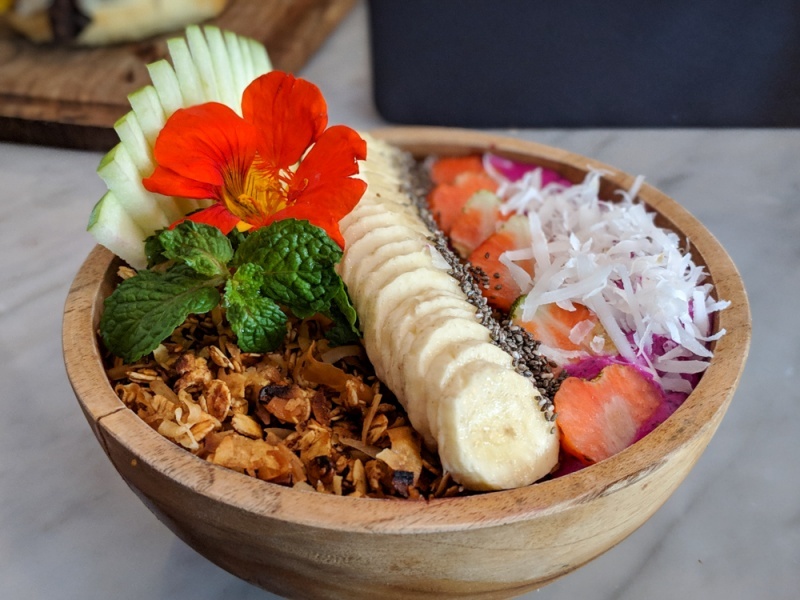 In addition to colorful smoothie bowls and yummy coffee concoctions, you’ll find all of your favorites like avocado toast, eggs benedict, and breakfast burritos. The Mocca Canggu is a darling little open-air cafe down a quiet alleyway. They have several delicious smoothie bowls to choose from as well as other healthy lunch options. Their lunches are very veggie heavy and flavorful. 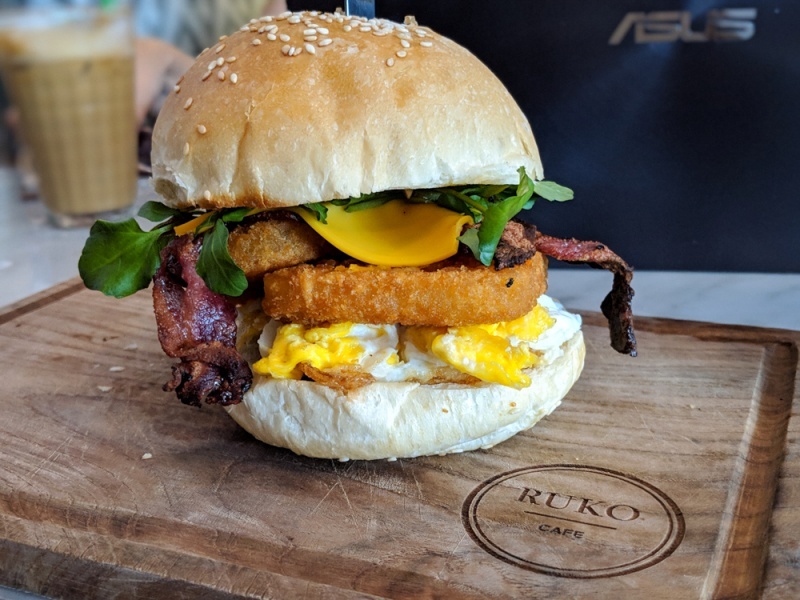 Ruko Cafe serves yummy smoothie bowls as well as hearty brunch options like the Brekky Burger. It’s a really popular spot but you can sit and relax for as long as you’d like, no one will bother you. It has a laid back vibe and is the perfect place to get some work done while sipping on good, quality coffee. Gowes Coffee also has colorful, delicious smoothie bowls for breakfast. They have a range of other healthy options, such as their signature “build your own salad in a jar” dish. If you want a more decadent option, their salmon eggs benedict is spectacular! Canggu is full of cute boutiques selling everything from bikinis to hammocks to macrame plant holders. It’s nearly impossible to walk by the picturesque shops without stopping. But the best places to buy local Indonesian treasures is at one of the lively Canggu markets! 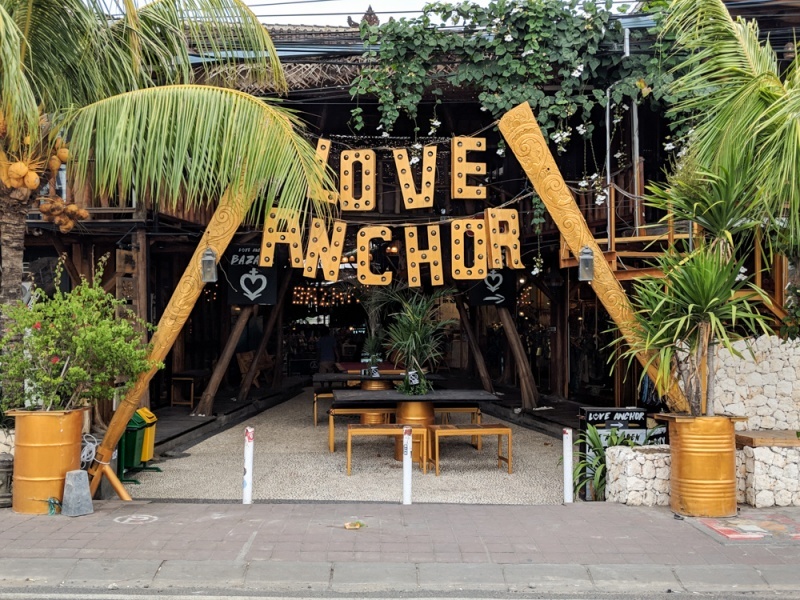 Love Anchor Canggu Market is open 7 days a week from 9:00am – 11:00pm. There are just a few vendors here, but they have some really cute dresses and jewelry to choose from. Prices are higher than you might expect, but lower compared to the boutiques in the area. Be sure to negotiate here – their first price is just a jumping off point. The Samadi Bali Market takes place every Sunday from 9:00am – 2:00pm. If you are looking to check out products made by local artisans, or want to buy some fresh, organic produce, this is the place to do it! 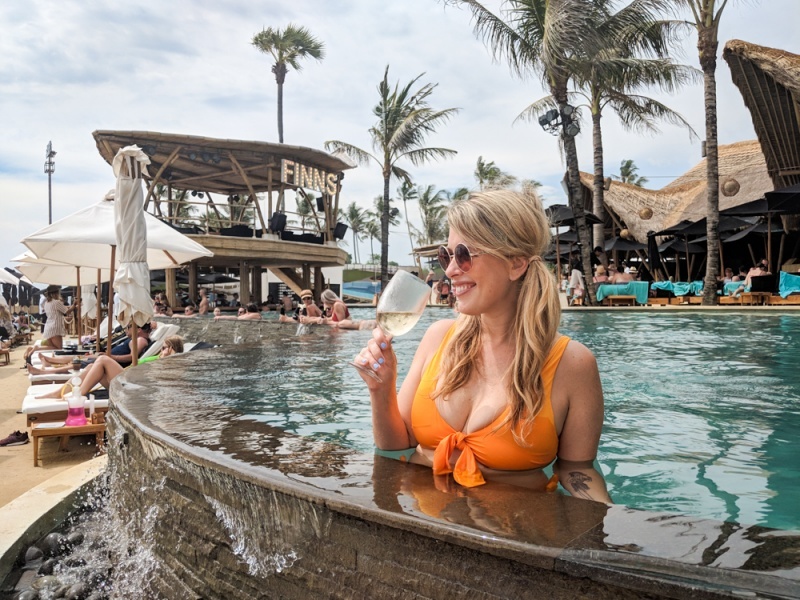 Spending a day at a pool bar is one of the top activities in Canggu, and Finns Beach Club is widely considered to be the best beach club in Canggu. But, in all honesty, we found it to be pretentious with too many rules. If you want to get a bunch of friends together to drop a lot of money on cocktails at a Vegas-like pool party, then this is the place for you. But if you’re just looking for a chill pool to hang out and enjoy reasonably priced cocktails, skip it. As you walk into the club you’ll be shown the “minimum spend” price list – 500,000 IDR per person for a single day bed, 2,000,000 IDR for a double day bed that fits up to 6 people, and 12,000,000 for a party platform that fits up to 20. Then your bag will be searched and you’ll be forced to leave any outside food or beverages (including bottled water) at the door. If you’re not commited to a full day at Finn’s, you can sit at any of the tables for no minimum spend. However, you are not allowed to leave your belongings at your table. So if you want to enjoy the pool you’ll have to either put everything in a locker (50,000 IDR rental fee) or take turns in the pool while one person sits with your things at your table. We found other pool clubs around Canggu to be much more our scene. Try out The Lawn Beach Lounge for a relaxed but hip pool club experience. They often have live music starting around 6:00pm. 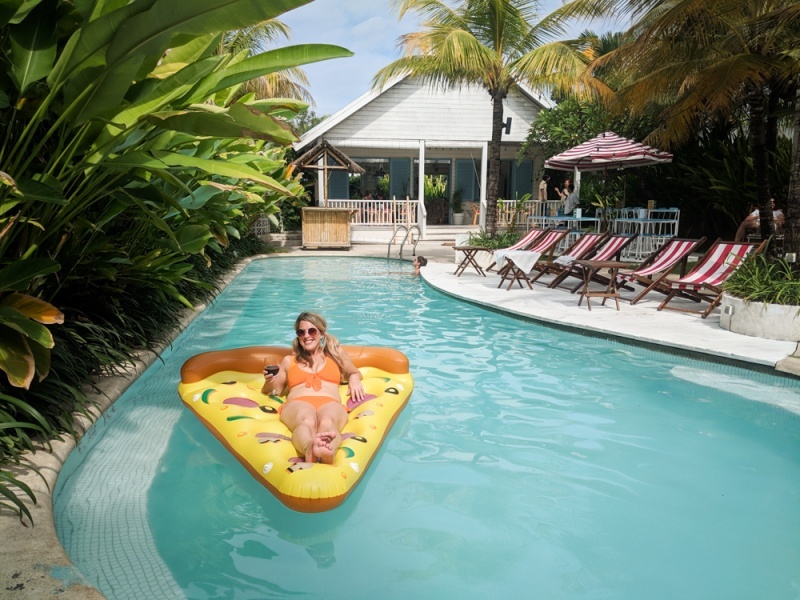 Or if you just want to chill out by a pool without all the pomp and circumstance of a Bali beach club then check out Panama Kitchen and Pool right across the street from Finns. No trip to Bali is complete without doing some yoga. After all, it’s where Elizabeth Gilbert ventured for some serious soul searching in the book Eat Pray Love. Technically Ubud is the most popular place on the island to practice yoga, but Canggu has quite a few lovely yoga studios to enjoy during your stay. The Practice is a popular yoga studio in Canggu that offers a full schedule of yoga classes for all levels. And the best news? All Tuesday night offerings at 7:45pm are free! A “warung” is a small family-owned business in Indonesia. Generally people use the term in reference to small restaurants that sell Indonesian food or groceries. And while there are countless restaurants around Canggu that serve Western specialties, Indonesian food is really delicious. It would be a shame not to sample the local cuisine during a trip to Bali! Warung “Murah” Restaurant (address: No., Jl. Pantai Berawa No.99, Tibubeneng, North Kuta) offers incredibly cheap prices and tasty dishes. You must try the gado–gado and nasi goreng. Prepare for a bit of a wait as they have a very modest kitchen. 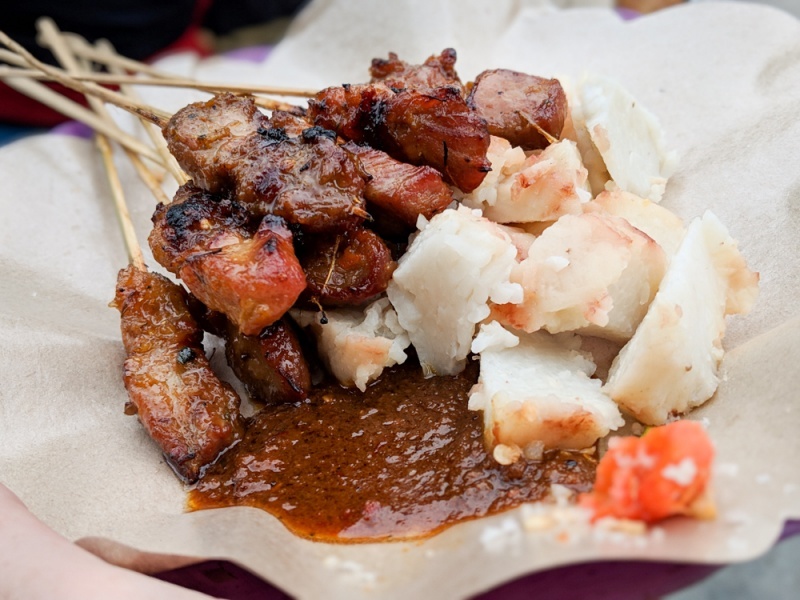 Our favorite street-eat in Canggu is the satay stand at the corner of Jalan Batu Mejan and Pantai Batu Bolong. It’s just a block north of the Love Anchor Market and you can find it on Google Maps as “Sate Babi Street Food”. Ten skewers of the most delicious pork sate you’ve ever eaten will only cost you 20,000 IDR! 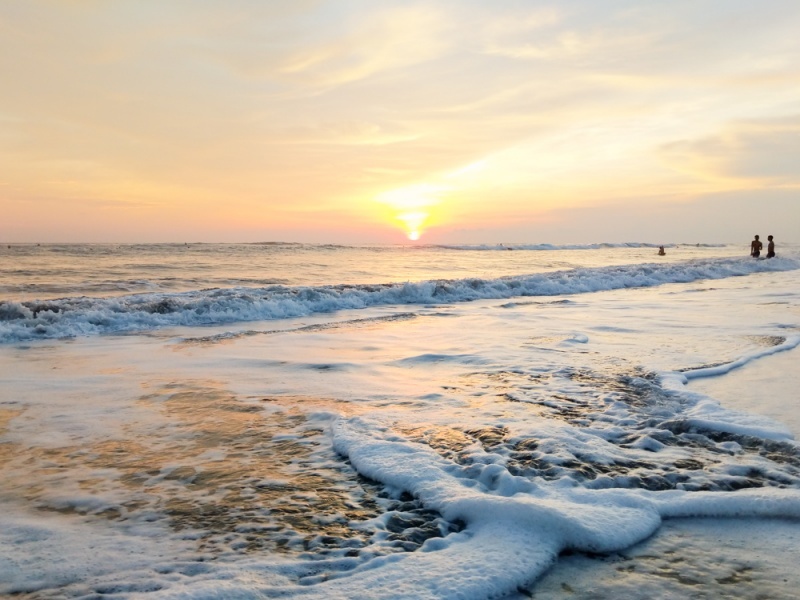 Sunsets are legendary in Bali, and Canggu offers a long stretch of western-facing coastline including some of the best beaches in Bali: Berewa Beach, Batu Bolong Beach, and Echo Beach. All of these beaches offer plenty of amenities so you can lounge while listening to music and sipping cocktails at sunset. Our favorite spot to watch the sunset over the Indian Ocean was on a comfortable lounge chair on Berawa Beach. This was our go-to spot after an afternoon of surfing. You’ll love the chill vibe here as the sky turn shades of pink and the waves crash against the shore. Old Man’s is a popular beach bar that is directly behind the surf break that bears the same name. As a self-described “beachfront beer garden”, people gather here at all hours of the day to eat, drink, and be merry. It’s popular with locals and expats and you’re guaranteed to make some fun new friends here. Don’t miss their happy hour from 5:00 – 6:00pm every evening or the popular “Dirty Ol’ Wednesday” drinking game night. Prepare to groove to live music in the evenings and jam out as a DJ spins your favorite hits later into the night. It’s one of the most popular bars in all of Canggu! 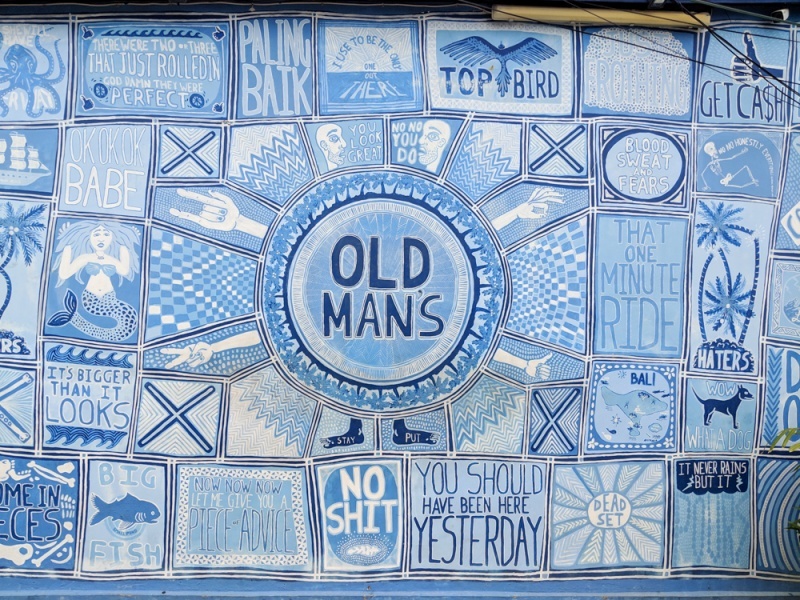 When the party starts to die down at Old Man’s, the young and hip begin to move inland to enjoy other lively bars scattered throughout Canggu. Some of Canggu’s best bars are located on the infamous “shortcut” that connects Berewa and Batu Bolong. Pretty Poison is a combination skate park, tattoo parlor, and bar. You can see expat and local skateboarders showing off their moves, get some new ink, and sip an ice-cold Bintang. Or head a few doors down to the Black Cat Mini Mart. Try the handle on the broken freezer at the back of the convenience store and you’ll find an actual speakeasy serving up good cocktails in a rad (but also super secret) setting. It’s one of the most unique things to do in Canggu at night! Enjoy your stay in Canggu! Want more help in planning your trip to Indonesia? Check out our favorite travel guides! Previous Post Koh Rong, Koh Rong Sanloem, or Koh Russey: Which Cambodian Island is the Best?